Learn how public libraries help children start school ready to learn. The West Bloomfield Township Public Library participated in this study. This website is a great tool to help you rate materials such as movies, video games, books, websites, music, and apps to determine if they are age appropriate for your child. The Harvard Family Research Project, now the Global Family Research ProjectTM, provides important research and strategies for engaging families to promote success in education for children. The organization was founded in 1983 and focuses on community engagement policies and practices, and offers tools and frameworks for community members and institutions who aim to improve the quality, accessibility, and sustainability of out-of-school learning experiences. Of note to museums and libraries is their work on Family Involvement and Complementary Learning. The mission of the Center on the Developing Child is to drive science-based innovation that achieves breakthrough outcomes for children facing adversity. We believe that advances in science provide a powerful source of new ideas focused on the early years of life. Founded in 2006, the Center catalyzes local, national, and international innovation in policy and practice focused on children and families. We design, test, and implement these ideas in collaboration with a broad network of research, practice, policy, community, and philanthropic leaders. Together, we seek transformational impacts on lifelong learning, behavior, and both physical and mental health. Helping children achieve their full potential. The Institute for Learning & Brain Sciences (I-LABS) is an interdisciplinary center dedicated to discovering the fundamental principles of human learning, with a special emphasis on early learning and brain development. This reading instruction resource is a great tool for parents to reference for elementary-age students to find help with reading comprehension for their child. Promoting Executive Function Life Skills is the basis of our work on Mind in the Making. Mind in the Making (MITM), a program of the Bezos Family Foundation, is an unprecedented effort to share the science of children’s learning with the general public, families and professionals who work with children and families. This website is specifically designed for parents and offers good information and brain development in young children, stages of child development, as well as parenting tips and frequently asked questions. This site from the National Center for Family Literacy is a unique tool to help you bring reading into your home. The Family Time Machine™ is fueled by your family's imagination! It recharges its batteries when your family turns moments of togetherness into family time by learning, imagining and playing. Reading is Fundamental's mission is to motivate young children to read by working with them, their parents, and community members to make reading a fun and beneficial part of everyday life. The Literary Resources site offers a wealth of support and information about reading and children. The countless choices reflect their determination to provide teachers and parents with current trends in education, down-to-earth suggestions on reading in the home, and no-nonsense strategies to improve children's reading. This website explores reading and writing development in young children. The website features articles and videos from top reading experts regarding best practices in the classroom, support for struggling learners and how parents can help their kids succeed. Sesame Workshop projects bring critical lessons in literacy, emotional wellbeing, health & wellness, and respect and understanding. Bringing research and hands-on experiences to show how technology can be used to teach children. This website is dedicated to the thousands of children who need to improve their reading skills, and to their parents who want to help them succeed. This site is full of tips, booklists, even short-term memory boosters. To ward off the learning loss that many children experience over the summer, Start with a Book offers adults engaging, research-based ideas for getting kids into books all summer and beyond. The free resources from Start with a Book build on what young children already like - dinosaurs, building, animals, sports, superheroes and music - so that parents, camp counselors, and others can have fun and interact meaningfully with children while helping to strengthen their reading skills. The simple act of reading with a child will have lifelong effects on the child. This website has many resources for parents including book lists, tips for reading with children of different ages, even tips for grandparents working with grandchildren. 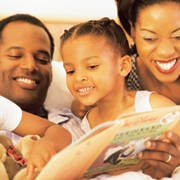 This website is a great source to find tips on how to help your child become a reader. Links lead to information on how to help your child learn to read, what to look for in reading programs, and simple strategies for creating strong readers.